Wichita auto repairs, oil changes, tune-ups, custom wheels, tires, diagnostics, much more. Our east and west Wichita service centers keep all vehicle makes and models running smoothly and looking great. Free car wash, Wi-Fi and Starbucks coffee. Your neighborhood expert for all auto repairs and services. 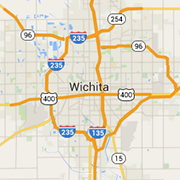 We have locations conveniently located in both East and West Wichita. Providing Wichita and the surrounding areas with truck toppers, tonneau covers, Rhino Linings®, and accessory sales and installations.